For over forty years I have had the honor and privilege of working with animals. 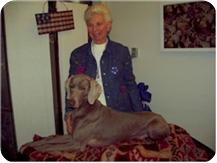 I started with activities involving my own Weimaraners, it evolved into a wide range of activities and levels in working with animals. I had the opportunity to work with a professional kennel owner who taught me grooming, training and how to run a kennel. I was able to train under a top professional handler in the area who taught me how to handle and present show dogs to their championship. I use these techniques in many ways and one of the most successful is in training, helping the animals to become calm and focused so that they can learn and become happy, well trained companions. My love and work with the animals is a personal rewarding profession and everyday is exciting and memorable.